HO SD-24 Locomotive - Special Edition! 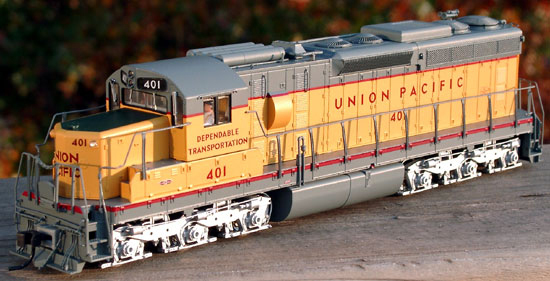 HO SD-24 Locomotive - New Paint Schemes! HO SD-24 Locomotive - New Road Numbers! New Numbers and Paint Schemes! HO Articulated Auto Carrier - New Road Numbers! HO Articulated Auto Carrier - New Paint Schemes! The Ford Fairmont was an rear wheel drive compact car introduced in 1978 and sold through 1983 in North America. As the first vehicle built off the Ford Fox platform, the 1978 Ford Fairmont replaced the Ford Maverick. This platform would serve as the foundation for several other models such as the Thunderbird, the 1981-82 American Ford Granada and the 1979-2004 Mustang. Three body styles were introduced with the release of the Fairmont--coupe, sedan, and wagon. The 1978 Fairmont set the record for production of a new model, defeating the record that was previously held by the 1965 Mustang, making it quite the rousing success for Ford. The Fairmont was an efficient combination of passenger room and cargo space for its size, garnering praise in the automotive media and drawing comparisions with competing Volvo and BMW models. At its introduction, the Fairmont was equipped with two headlights, though this was later remedied in 1981 where the number was upped to four. A variety of engines were available, including a 2.3 L four-cylinder, 3.3 L (200 cu in) six, and 255 cu in and 302 cu in V8s. A turbocharged four-cylinder version was planned for 1980 but never made it to production. Coming in a range of prototypical colors, these vehicles will look right at home parked in front of our garage kits, out on the streets of your layout, or, for layouts based in late 1977 or 1978, as loads on open auto racks. These models are officially licensed by the Ford Motor Company?.